My delight in this drink takes me by surprise. 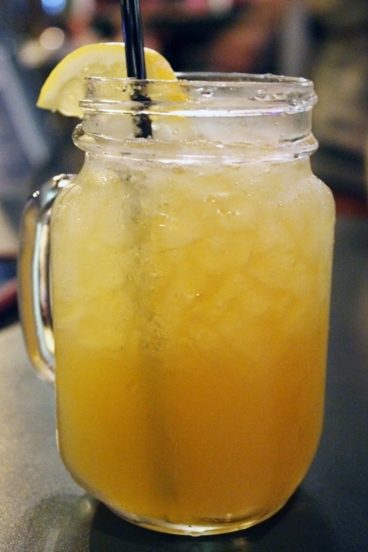 It is made with Firefly sweet tea vodka, sour mix, simple syrup, and Malibu mango rum. If you are a regular reader of this blog, you already know why the Firefly Mango Palmer was more likely to be a middle of the road drink for me rather than one that makes me smile with each sip: the sour mix. I won’t go on at length about it again, but factory-produced sour mix can often taste like nothing more than lemon juice concentrate with an unhealthy dose of chemical corn syrup. Here’s the kicker—it tastes like that in the Firefly Mango Palmer, too. But the mango rum and simple syrup’s sweetness soak up all those bad qualities, moderating their sugar content with the acidity of the sour mix. This transformation of bottled sour mix’s obnoxious qualities into a greater good results in a tea drink that I dig a lot. You pulled one over on me, Alivia’s. I approve.